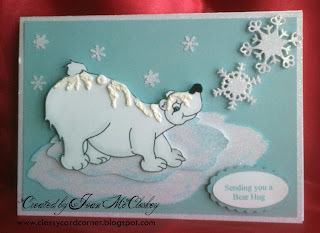 Joanie's Classy Card Corner: Sending You A Bear Hug!! I used background cardstock from my stash. The Chilly Bear digi I fussy cut and popped him up. For the icebergs I used some clouds from my MTC Gallery and pulled them in what I thought was iceberg shapes ;) cut them on my Zing and popped them up on different levels. The large snowflakes were cut with a Spellbinders Die from Diamond Dust paper, so there is no loose glitter. The snow on the Bear's back was done with Tulip Puffy Paint. The small snow flakes were done with a Martha Stewart Border punch and I just used the little flakes that were punched out. The sentiment ovals were also done with Spellbinder die. I just touched the icebergs with a Copic Marker to add a little frozen look. It really is a "cool" card, just hard to get all to photograph. So this is my post for The Sunshine Mail Children and hope you join in and send a card too!! Check out the site by clicking on the highlighted link above and you will see just how happy you can make a child by just sending a card. There are other ways to donate if you're not a crafter and hope you check it out. Thanks for visiting today and hope you come back soon. Early detection could save your life! !